The following are links to associations that relate to our agency and are provided for your convenience. *all information accessed and obtained from the official TAAD website and is property of the Texas Association of Appraisal Districts. Information is current as of March 15, 2013. The Texas Association of Appraisal Districts, Inc. is a statewide, voluntary non-profit organization incorporated and organized to promote the effective and efficient functioning and administration of appraisal districts in Texas. In 2012, more than 90 percent of the state's 254 appraisal districts belong to TAAD, as well as numerous tax officials from school districts, cities, counties, state agencies and other entities, and other property tax professionals. TAAD's members govern the association through a yearly Delegate Assembly, which serves as the vehicle for adopting bylaws, policies, beliefs and resolutions. Twenty trustees, one for each of TAAD's regions, represent the member districts before the Executive Committee. This committee is made up of a president, president-elect, vice president, secretary-treasurer and past president. With the help of various volunteer committees and TAAD's staff members, this group implements the programs and services TAAD provides to its members. 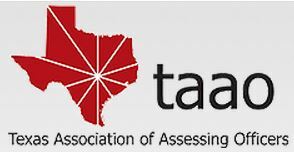 *all information accessed and obtained from the official TAAO website and is property of the Texas Association of Assessing Officers. Information is current as of March 15, 2013. Texas Association of Assessing Officers (TAAO) unites the state's leading Ad Valorem Tax Professionals. It is their purpose to set the standards of professionalism in our industry through ongoing education, and to enlighten it's members, government officials and the taxpaying public regarding fair and equitable tax administration. TAAO was organized as a professional trade association in 1939 by a group of city tax assessors who were dedicated to the advancement of property tax administration in Texas. The association was organized for the purpose of improving the standards of assessment practice and providing education for its members. They organized because of the changing times and the realization that individuals could not keep pace unless they organized. They were faced with many problems and operated solely as an affiliate of the Texas Municipal League (TML). The assessors’ meetings were held during the TML conferences and never exceeded more than part of a day. Today the TAAO conference covers a five day period. TAAO's mission statement, as adopted by their board of directors, is to provide leadership in property valuation, administration, and tax policy in the State of Texas, and through education, increase and improve the knowledge and professionalism of ad valorem tax practitioners. *all information accessed and obtained from the official IAAO website and is property of the International Association of Assessing Officers. Information is current as of March 15, 2013. The International Association of Assessing Officers is a nonprofit, educational and research association. It is a professional membership organization of government assessment officials and others interested in the administration of the property tax. The IAAO was founded in 1934, and now has a membership of more than 7,300 members worldwide from governmental, business, and academic communities. IAAO members subscribe to a Code of Ethics and Standards of Professional Conduct and to the Uniform Standards of Professional Appraisal Practice. The mission of IAAO is to promote innovation and excellence in property appraisal, assessment administration, and property tax policy through professional development, education, research, and technical assistance. IAAO will be the internationally recognized leader and preeminent source for innovation, education and research in property appraisal, assessment administration and property tax policy. *all information accessed and obtained from the official TAR website and is property of the Texas Association of Realtors. Information is current as of March 15, 2013. Headquartered in Austin, TAR is the state-level organization for REALTORS® in Texas. There are also national- and local-level REALTOR® organizations. The Texas Association of REALTORS® was established in 1920 and has grown to more than 80,000 members. We are the largest professional-membership association in Texas. The association currently employs more than 50 people. There are 89 local affiliate associations divided into 16 regions. Each region has annual meetings where members get industry updates, network, and have opportunities for professional development.